This entry was posted on March 5, 2012, in Art Criticism, Craft and tagged Art, art criticism, Craft, Culture, Fiber Art, FiberPhiladelphia 2012, mixed media, Olde City Philadelphia, Reviews. Bookmark the permalink. FiberPhiladelphia 2012 brings the eighth such international biennial celebrating the textile and fiber arts to Philadelphia. However, those attending the First Friday gallery openings in Olde City this past Friday night did not see the everyday mind’s eye image of cotton or wool-loomed rugs or fashionable clothing that one might expect. Starting at the Snyderman-Works Galleries, I was immediately drawn to just the sheer amount of pieces inside spread over multiple levels. 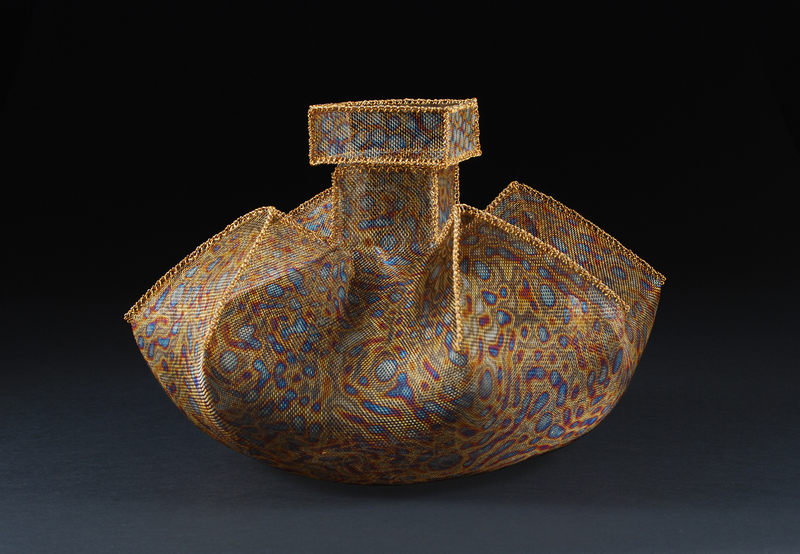 The featured artists such as Shizuko Kimura, Warrin Seelig, and fifty-five additional artists show that materials such as diverse as Kimura’s muslin embroideries vs. Seelig’s slate and silver-brazed stainless steel are equally as much a part of materials utilized in the craft fiber genre. Ann Coddington Rast’s Mother/Memory (approx. 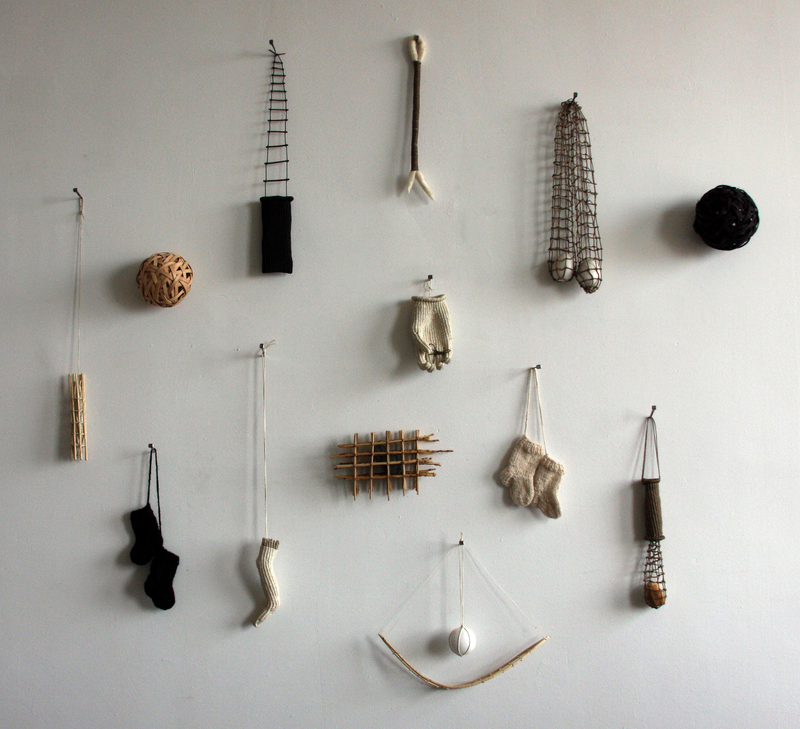 6’x 6’x 6″, mixed media, fiber, 2011) is an installation of thirteen objects that use traditional forms of knitting and basketry that she weaves into dichotomies of not only color and form, but of how emotions prevail over one’s intellectualizing of her pieces. Self-describing her work, she writes: “The hollow forms are membranes, thin skins separating the outside world from the dark interior. The openings where the two meet create a locus of intensity; the rim, the edge, the lip.” The petiteness of the organic forms Coddington Rast chose for this specific piece do imply a child-mother reference although the artist seems to prefer a visceral reaction from her viewers; however, one cannot help but wonder about the individual connections each piece makes to the entire tableau. Washington state-based sculptor Lanny Bergner’s Cannister of Filled Air (11″x 15″x 15″, stainless steel mesh, coated copper wire, 2011) makes one rethink what is a common perception of vessel forms. There is no ceramic here, nor hard-edged metal forming, but rather hand-stitched pieces of heat-colored stainless mesh that is constructed into an architectural, almost chimney-like spout. Bergner’s pieces project a feeling of a perfect discipline and symmetry, even though he uses rather organic structures that certainly would naturally parlay an unwanted inconsistent flexibility in his overall forms. He is able to “tame” the wildness of his chosen materials, in this case, wired metal mesh – not one’s notion of everyday “thread”. “8th International Fiber Biennial” can be viewed through April 28, 2012 at Snyderman-Works Galleries, located at 303 Cherry Street in downtown Philadelphia, PA.